Cityboy is machismo on a grand scale. It stars epic amounts of alcohol and drug consumption, completely unfettered greed, selling your soul and complete and utter burnout. Articulated by an insider who got out. Geraint Anderson worked in the City for 12 years. He got out before he burned out. Although, by his own admission, he turned into a monster and subsequently "needed to engage in 12 years' of repentance." The writing is dodgy. Anderson chronicles everything that is wrong with the City in his own unique colloquial city-speak. 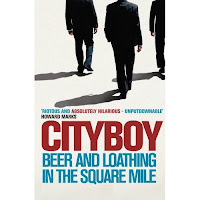 This book is based on the column he wrote for the now defunct thelondonpaper. Verdict: read this and weep. Literary fiction it ain't. Riveting, horrifying, compelling it is. If nothing changes from this account, we are doomed to bail out the excesses of the industry for the foreseeable future.